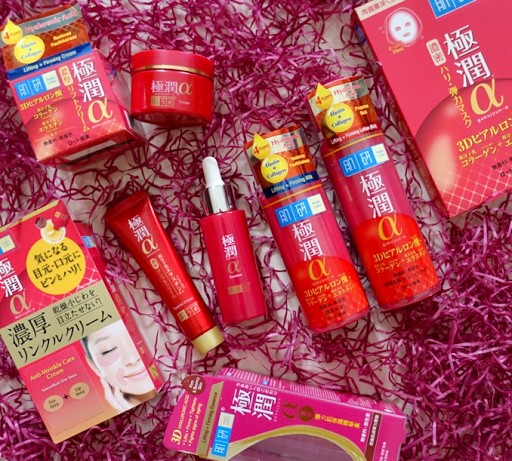 The two key ingredients in the new and improved Hada Labo Lifting & Firming range are Hydrolyzed Elastin and Hydrolyzed Collagen, which work together at the cell level to enhanced the skin strength, firmness and shape. 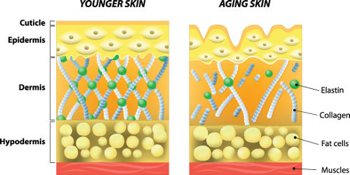 Elastin and collagen are both essential to maintain skin firmness and elasticity. On top of that, the range is also infused with Elasgrow and Fermented Soymilk, an exclusive ingredient to boost collagen and elastin production that helps improve skin density, firmness and elasticity for a more visibly tighter, firmer and lifted skin. The new and improved range is also upgraded with 4 types of Hyaluronic Acid to further hydrate skin from the surface till the inner skin layers for a significantly soft, smooth and supple skin. It also contains powerful anti-oxidants properties to fight against damaging effect of free radicals. Lifting & Firming Lotion - Rich (RM67.50) - It is an essential first step after cleansing to helps awaken skin and drives moisture deep into the inner skin layers and prepare skin to fully receive benefit of the next skincare. For best results, use twice daily after cleansing. Gently pat the lotion onto the face until throughly absorbed. Lifting & Firming Milk (RM70.90) - A light-weight milk that easily penetrates deep into the skin to restore a youthful radiance and luminosity, leaving skin visibly firmer and smoother. Apply twice daily after lotion/essence application. Gently pat onto the face until throughly absorbed. Lifting & Firming Cream (RM78.00) - The velvety cream melts into the skin to provide an intense nourishment to strengthen and improve the skin's youthfulness, leaving skin visibly lifted, firmer and more luminous. After the application of lotion/essence, take a sufficient amount, gently massage and pat the cream on the face and neck area. Lifting & Firming Wrinkle Care Cream (RM74.90) - Designed to treate age sensitive contours around the lips and eyes, the rich and nourishing cream helps to reduce fine lines, revealing a plumper, more youthful and renewed skin texture. Use twice daily after moisturizing by gently dab onto wrinkle prone areas such as the forehead, eyes and lip area. Lifting & Firming Mask (RM52.90) - A serum-soaked mask enriched with anti-aging ingredients to deeply hydrate the skin and restore the skin's youthful vitality. Upon application, skin feels instantly revitalized, lifted and smoother. The Lifting & Firming Mask can be used once or twice a week. Lifting & Firming Essence (RM89.90) - The essence contains derived Pomegranate extract and Lycopene, which boasts 100 times more antioxidant power than Vitamin E to fight signs of aging and pollution. It also contains Soybean Extract to help improve skin elasticity and boost collagen and elastin in the skin for a firm and youthful skin. The Lifting and Firming Essence is formulated with High Performance Penetrating & Deep Moisturizing (HPP&M) Technology which has an active delivery system to drive moisture deep into the skin and hydrate from the surface to the inner skin layers. This also works to prepare skin to receive the full benefits of skincare that follows. Apply on palms and gently pat onto the face until fully absorbed. For best results, use after Hada Labo Lifting & Firming Lotion. The Hada Labo Lifting & Firming range is pH balanced and free from alcohol, fragrance, colorant as well as mineral oil and available at all major pharmacies.